Ugh, this country. UGH. It’s enough to make you want to exile yourself from society. We are so blind, so foolish, so cruel, so disgusting. In many ways, we deserve the terrible fate that’s coming to us. Honestly. If the Noah movie does anything right, it’s pointing out how repugnant mankind has been to nature. This story in the Washington Post points to a horrifying practice of dropping live chickens into “the scalder.” I can think of many politicians I’d like to do that to but innocent chickens? No. Two animal welfare groups and dozens of lawmakers are urging the Obama administration to improve humane treatment of poultry at slaughterhouses, citing statistics that show hundreds of thousands of chickens being accidentally dropped alive into scalding tanks every year. The Animal Welfare Institute and Farm Sanctuary have petitioned the Department of Agriculture’s Food Safety Inspection Service to strengthen humane treatment regulations, by, among other things, banning live birds from the scalding tanks. When things go according to plan, birds are already dead by the time they’re dropped into the tank, but a small percentage miss the automatic knife that is supposed to slit their necks and wind up dying in the tank. 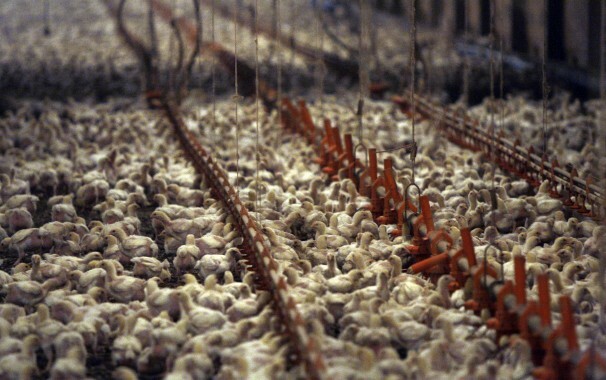 Birds that die by means other than slaughter are called “cadavers” and not allowed to enter the food supply. Last year, FSIS records show, there were roughly 680,000 cadavers, down from around 730,000 the year before. FSIS officials say the majority of cadavers are birds that have been dropped into scalding tanks alive. “Dying other than by slaughter causes tremendous suffering to how ever many birds are subjected to this treatment,” said Dena M. Jones, the Animal Welfare Institute’s farm animal program manager. Tom Super, a spokesman for the National Chicken Council, said there’s an economic — as well as ethical — incentive to reduce the number of cadavers. He said that when birds miss the automatic knife, an employee is used as backup to keep live birds out of the scalder. Rep. James Moran, a Virginia Democrat who co-chairs the Congressional Animal Protection Caucus, said he thought the number of chickens “boiled alive” in the U.S. was significant. Virginia is 12th in the nation, according to the National Chicken Council. The animal welfare groups’ petition also says that birds aren’t always properly stunned, which is supposed to make them insensible to pain before slaughter; and that many birds suffer broken or dislocated bones when they are shackled for slaughter. Super said that his group issued new guidelines last month requiring stunning to be more effective, with a goal of at least 99 percent of birds effectively stunned and insensible to pain, and corrective action required when it falls below 98 percent. And he said companies must have a monitoring program for wing and leg injuries, and retraining of employees when standards are exceeded. Derfler, of the FSIS, said the agency works under existing law to ensure humane treatment of chickens, relying on the Poultry Products Inspection Act, which condemns adulterated products, including birds that die by means other than slaughter. Temple Grandin, a noted professor with autism whose life’s work understanding livestock was the subject of an HBO movie, said birds entering the scalder alive used to be a bigger problem than it is today.